So you're a Canadian, eh? Are you frustrated when you find worksheets with misspellings of common words like centimetre, favourite, colour, theatre, centre, litre, labour, and neighbourhood? We heard you loud and clear. We listened and delivered! 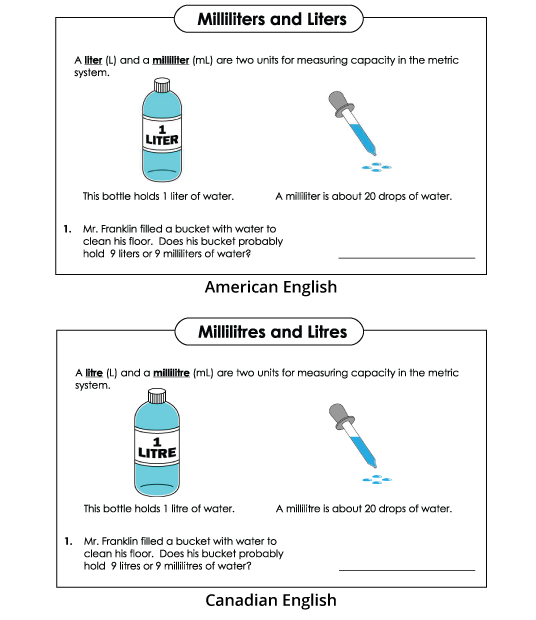 Many worksheets are now available in Canadian English! To access them, click the language button below a worksheet's description. If you marked Canada as your home when you registered, the language button may appear as a maple leaf for worksheets translated into Canadian English. We haven't "translated" all of our worksheets yet, but if you'd like a specific worksheet converted to Canadian English, just shoot us an email. We'll do it as soon as possible. If you're in Canada and don't see the maple leaf logo by these worksheets, please contact our customer support and we'll set your location to Canada. And don't forget... we also have special pages with Canadian Maps and Canadian Money. We know how polite Canadians really are. You can thank us by sending autographed hockey pucks, Kinder Surprise Eggs, hand-drawn pictures of the queen, and loonies.